…and now throw it across the classroom! Quick twist on a old revision idea to share today. Yr 12 are prepping for their AS history exams in a couple of weeks and the key is both in selecting what areas to include in a question, and for potential A/B students getting the order and the links between the sections right. Once they realised I wasn’t joking the obliged, picked up another paper and added their first idea on how to answer the question. 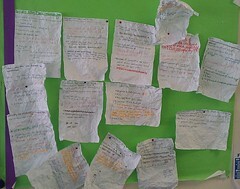 Then then rescrunched and threw again, repeating the process until each question had 5 possible ideas for paragraphs on. They then had to work together to work out what (if anything) they would drop from the list or add, and then what order they would write them in and what could link them. This had two advantages on the usual ‘pass the papers’ activity. The first was stress relief – not to be underestimated as exam time looms ever closer. The other (which I hadn’t thought about until it happened) was that students ended up sharing ideas across the classroom, rather than with the people they normally work with around their tables. Go on, give it a go. Throw it across the classroom! Pingback: blog.mrstacey.org.uk » Blog Archive » …now attack it with scissors!